Fancy trying one of Hong Kong’s famous buffets, but don’t fancy emptying out your wallet at the same time? Ignore the big names. Five-star hotels like the Intercontinental hog the buffet table headlines, but they will cost as much as HK$800 for the full selection. Many of the restaurants in our ​best Hong Kong buffet list aren’t cheap either and your bill will come in at HK$400. However, there are buffets in Hong Kong that can be done cheaply​—and that doesn’t mean badly. Below are five of the best cheap Hong Kong buffets, where you should expect to pay between HK$100 and HK$200 for your dinner. Expect to pay a little bit more on Saturday and Sunday. The Shamrock Hotel in Jordan is a bit of a Hong Kong institution. It’s by no means up to the standards of the big brands, but what the hotel lacks in finesse it makes up for in character—and the same is true of the Shamrock Café’s buffet. The menu is western but often tweaked to Chinese tastes, so you’ll find chicken wings but in a sweet and sour sauce, while staff hang around rather than help. From the plastic cases covering the food to the mismatched delphware, the Shamrock feels dated, but at HK$110 for a lunch or dinner buffet of pretty decent food (including brilliant waffles), this is a great value. The buffet runs every day. Where: 223 Nathan Road, Kowloon. You may not think much of this restaurant when you arrive to see the sign bandaged to the side of a crumbling concrete block. Be brave. This is a city that knows Korean food inside out, and Korea BBQ restaurant has been open for an age. It’s still hard to find a seat most nights. If you’re not familiar with Korean BBQ, it involves picking the slices of meat you want and cooking it up yourself over an open flame back at your table. The selection here is phenomenal; beef is the star item with beef short ribs, thinly cut sirloin, and beef roll all on offer. You’ll also find chicken, pork, and a fine selection of spiced up Korean vegetables. Pay HK$150 for all you can eat and staff are relaxed about how long you stick around. Consider booking ahead—especially on the weekend. Want to skip straight to dessert? Try the ice creams on offer at the Marriot Courtyard. Not only will you get your choice of vanilla, chocolate, and other Haagen-Dazs ice creams, but there are also limitless lemon and peach slushies. The buffet is offered between noon-4 p.m. on weekends and costs HK$168 or HK$118. During the week, the Marriot also offers a well-priced lunch buffet; for HK$158 you can choose from noodle stations, a salad bar, and a superb selection of desserts. Handy if you’ve been shopping in Tsim Sha Tsui or visiting the museums on the waterfront, Café Muse serves up good food in an area stuffed with overpriced tourist traps. 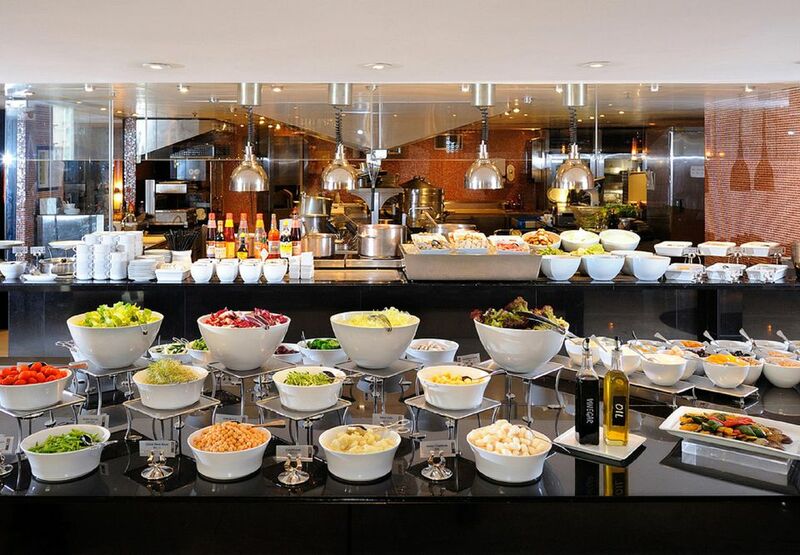 There are a number of ways to do the buffet at Café Muse, but the best value is the semi-buffet lunch. For less than HK$100 on weekdays, you choose one main dish and then help yourself to an endless selection of salads and desserts. It’s the cheapest buffet on our list. You’ll find pizza and pasta dishes, meat and potato combos, and other international dishes on the menu that are well-executed rather than excellent. Families are welcome and there is usually a table free, but be warned, they close at around 9 p.m.